Carotid artery stenosis is a major risk factor for ischemic stroke. Carotid endarterectomy protects patients with severe atherosclerotic carotid artery stenosis against stroke. In such patients, arterial blood pressure is often difficult to control and perioperative hemodynamic instability is associated with high morbidity and mortality after carotid endarterectomy. We performed a randomized double-blind placebo-control trial to evaluate the effects of low-dose dexmedetomidine on hemodynamic stability during the emergence and the recovery phases of general anesthesia in patients undergoing carotid endarterectomy. Forty-seven patients (68–84 years) were randomly assigned to receive either dexmedetomidine (DEX group) or 0.9% saline (control group). Infusion of dexmedetomidine 1.0 µg/kg/hr for 1 h, followed by 0.2 µg/kg/hr or the same dose of saline was started after carotid artery declamping in the DEX and in the control group, respectively. At the end of surgery, nicardipine was used to maintain systolic arterial pressure within 20% of preoperative values. We compared the maximum dose of nicardipine, time to extubation, plasma catecholamine levels, arterial blood gases, the Richmond Agitation Sedation Scales, visual analogue scale (VAS) in the postanesthesia care unit, and adverse events within 30-days between the control and Dex groups. The baseline clinical characteristics were similar in the two groups. The maximum dose of nicardipine (p = 0.021), plasma norepinephrine level (p = 0.033), sedation score and VAS were significantly lower in the Dex group than the control group. There were no differences between the two groups regarding time to extubation, arterial blood gases, and adverse events. 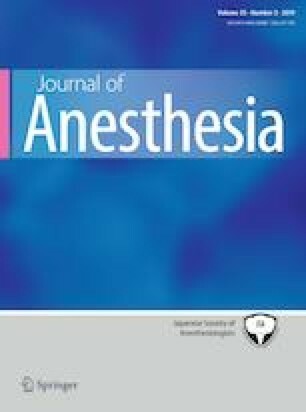 Low-dose dexmedetomidine improves hemodynamic stability during emergence and recovery from general anesthesia in patients receiving carotid endarterectomy. A comment to this article is available online at https://doi.org/10.1007/s00540-019-02633-5. The authors are grateful to all the pharmacists and nurses who contributed to data collection. Supported, in part, by a grant from Clinical Research Fund at Yao Tokushukai General Hospital. The author(s) declare that they have no conflict of interest.